Good characterization. This is a series of short stories, and each one contains a separate POV character. Most of them are compelling characters. Fantastic setting. Drayden did an excellent job of depicting Ravnica from the ground level on up. This was a tough feat, considering how much of a fan-favorite the world of Ravnica is. I listened to the ‘Voice of All’ podcast of this, and they did a FANTASTIC full cast audio production of it with music and sound effects and everything. The Gatewatch characters don’t appear, meaning the focus of this story is on the people of Ravnica and their foibles. I found most of the stories to be fascinating, but if you’re along for the ride only to follow the story of the Gatewatch then you’re going to be out cold for this one. Similarly, most of the stories here are low-stakes. These stories are all slices of life of various citizens of Ravnica, from Dimir smugglers to Azorious lawyers to Orzhov oligarchs. None of the stories were end-of-the-world affairs, but instead served only to breathe life into the setting. I liked the low stakes because it allowed Ravnica to be Ravnica, but if you want to get your blood pumping this might not be what you’re looking for. This is a work of franchise fiction, and as such if you’re not already a fan you’re going to have some trouble getting into this. That said if you are a fan, I think chances are you’re going to enjoy it. Man, where to begin with this. I think this is probably the best work of Franchise Fiction I’ve ever read. It has several things in it’s favor. This is the first time I’ve ever had the pleasure of listening to the ‘Voice of All’ podcast’s full cast production of the short stories, and they did a fantastic job of bringing this to life. They used music, sound effects, and many different voice actors to perform the stories. I’m a sucker for full-cast productions, and this most certainly scratched that itch for me. I’m a fan of Nicky Drayden’s first book ‘The Prey of Gods.’ It wound up being in my top 5 books of 2017. Her whimsical-but-serious style was well served here, allowing Izzet Chemisters to be silly and Rakdos Demons to be in love. The plot for these short stories wasn’t too grand. I’ve read a million stories, a lot of which are epic tales of world-shattering import. While I enjoy reading them, sometimes I’m in the mood for a change of pace. Sometimes I just want to read a story about a father struggling to make rent and put food on the table for his growing family. Or I want to read a story about a mother and daughter bonding, sharing a secret that they don’t want their father to know. Or I want to read about a teacher who’s teaching her students the old ways of a dying culture in a fast-changing world. Sure, the struggling father is a smuggler-wizard-spy, the mother and daughter are necromancer-bankers, and the teacher a merfolk. But in the end these are stories about small people just getting by on the day-to-day basis, the sort of stories which could happen to anyone. Ravnica isn’t just a city of Paruns and Planeswalkers. Average Joe lives there too, and he likes drinking beer. I loved the stories. They were short, sweet, and didn’t overstay their welcome. 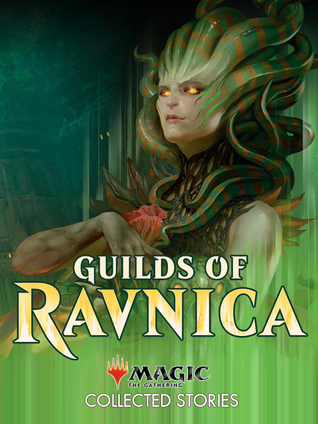 They allowed the worldbuilding of Ravnica to flex is muscles, letting the very Guilds really show what makes them special from the ground level on up. In Drayden’s hands Ravnica feels home-y; a weird home, what with the massive lightning elementals and the eternal guessing game of ‘who is the Dimir spy in this episode,’ but ultimately familiar to the setting we know and love. Anyway, if you’re a fan of the game I suggest you check it out. Though honestly I think that this anthology of short work is readable enough that a curious non-fan who has a little patience can enjoy it too. You don’t need to read the last five years of MtG lit to understand what’s going on here, so this has that going for it. The podcast is free, and so is the original source stories, so it costs you nothing to try. I’m looking forward to ‘War of the Spark.’ I’m hoping that some of you will be along for the ride too.